When it comes to ballpark food, it's all a matter of personal taste. Some fans never deviate from the time-honored combination of a hot dog and a beer, while others go out of their way to sample regional delicacies or oversized monstrosities designed to both clog arteries and garner social media likes. In my case, another variable comes into play: celiac disease. I was diagnosed with celiac disease, an autoimmune disorder, in 2012. As a result, I had to go gluten-free, meaning that my diet can no longer include wheat, rye or barley. Many ballpark items are therefore off-limits to me, which leads to a simple question: Why is a guy with celiac disease writing about his favorite ballpark foods, most of which contain gluten? First, it's part of my job, and I am still able to appreciate the extent to which these items reflect both regional culinary culture and front office creativity. Second, at nearly every ballpark I visit, I recruit a Designated Eater. This individual consumes the ballpark food that my gluten-free diet prohibits. I live vicariously through them. So let's get to it. Like last week's "Best Ballparks" article, this list of my favorite Minor League food items is broken down by level of play. You, the reader, will almost certainly disagree with the selections. Here's hoping that they whet your appetite for discussion. Whether it's gooey, hazmat-suit yellow, processed cheese product or a dedicated stand featuring a customizable toppings bar, nearly every Minor League team serves nachos. But the Minors' most iconic nachos can be found at the Memphis Redbirds' home of AutoZone Park. Rendezvous BBQ Nachos -- topped with cheese, pork, barbecue sauce and dry rub -- are the result of a partnership with Charlie Vergos' Rendezvous (a famous downtown barbecue joint located in close proximity to the ballpark). These nachos are beloved by Redbirds fans, who were deeply disappointed in 2014 when the team, then run by the parent St. Louis Cardinals, discontinued their contract with Charlie Rendezvous' BBQ. The Redbirds' new ownership group restored the partnership prior to the 2017 season, leading to #RendezvousReturns becoming a trending hashtag in Memphis. 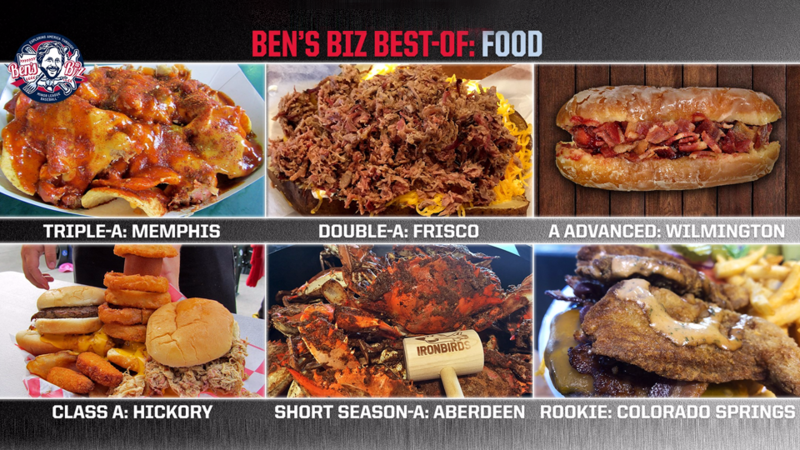 "Barbecue has been a hot topic at the ballpark over the past couple of years, and we have a little 'sauce on our face,' so to speak, from the last few seasons without Rendezvous," said Redbirds general manager Craig Unger at the time. "You can pass us a napkin, because we cannot wait to dig into the world-famous Rendezvous BBQ Nachos with everyone this season." Speaking of partnerships with barbecue joints, the Frisco RoughRiders teamed up with Rudy's "Country Store" and Bar-B-Q (an oddly punctuated Texas-based chain) prior to the 2017 season. Dr Pepper Ballpark's Rudy's Bar-B-Q stand features a Loaded Brisket Baked Potato, a jumbo-sized spud split open and topped with cheese, sour cream and -- proving that everything really is bigger in Texas -- a gargantuan mound of succulent chopped brisket. Further flavor can be obtained by adding one of two available "Sauses:" Original or Sissy. "This brisket is one of the best briskets I've had," said Frisco RoughRiders Designated Eater Lance Carter. "I've had a lot of Mom and Pop-type briskets, but Rudy's Bar-B-Q is always tops when it comes to the brisket." Prior to the 2015 season, the Wilmington Blue Rocks unveiled a startling new concession item: "a hot dog inside a traditional glazed donut bun with bacon and raspberry jelly drizzled on top." This initially unnamed creation enjoyed immediate viral stardom, becoming a Twitter sensation en route to mentions on media outlets such as "Good Morning America" and "USA Today." A "Name the New Donut Dog" contest led to this sweet and salty creation being anointed "The Sweenie Donut Dog," in honor of 1995 Blue Rock Mike Sweeney. "It's very sweet," said Blue Rocks Designated Eater Ryan Van Duyn. "Jelly on bacon is nice; the hot dog is just along for the ride. This is definitely something that you have to try, but not an everyday type of meal." Concession items rarely, if ever, get more ludicrous than the Hickory Crawdads' CLAWlossal: a foot-long chili cheese dog, pub chips, a half-pound burger, a pulled pork sandwich, a corn dog, five onion rings, two jalapeño poppers and two pickle spears. This everything-but-the-kitchen sink paean to American decadence is enough to feed the whole family, but iron-stomached individuals can pay a reduced price and take the "CLAWlossal Challenge." The challenge? Finish the whole thing in six outs or less, and you'll get your money back as well as enshrinement on the CLAWlossal Wall of Fame. When I visited Hickory in 2014, Designated Eater Alex Ward got tantilizingly close to finishing, but ultimately suffered what those in the competitive eating community refer to as a "reversal of fortune." Maryland and steamed blue crabs go hand-in-hand (or claw-in-claw), and in each of the past two seasons the Aberdeen IronBirds have celebrated this relationship by playing a game as the "Steamed Crabs." During this game, as well as all Sunday games, the team offers an all-you-can-eat Steamed Crab feast (a team logo mallet is part of the package). This makes for one of the most unique -- and certainly the messiest -- culinary experiences one can have at a Minor League game. The scent of Old Bay seasoning permeates the air from the first inning to the last. "I think it's the seasoning, and the fact that we eat them hot," said IronBirds concessions manager Tim Graham. "There's a sweet succulence to the meat that I really like. ... I don't know, just getting that Old Bay seasoning on your fingers and pulling that sweet meat out little by little, there's nothing like it. It's a great way to spend a few innings." This is a strange pick, in more ways than one. The Triple-A Sky Sox called Colorado Springs home for the past 31 seasons, but that team has moved to San Antonio. In its place at Security Service Field in 2019 will be a Pioneer League team, which has not yet announced its name. One of the finalists in the Name the Team contest is Rocky Mountain Oysters, a reference to the polarizing delicacy that is, yes, deep-fried bull testicles. Over the 2018 season's final weekend, the team looked toward its imminent Pioneer League future by debuting a Rocky Mountain Oyster Burger. Even if one of the other "Name the Team" finalists -- Lamb Chops, Happy Campers, Punchy Pikas and Throttle Jockeys are the other choices -- is selected, there's a decent chance that this supremely meaty burger will be on the menu in 2019. It's topped with cheese, bacon and, of course, the aforementioned euphemistic "oysters." "It's surprisingly not bad, but better the less you think about it," said Colorado Springs Designated Eater Zeke Perez, the first fan to try the burger. For the record, Colorado Springs is one of three teams to have served Rocky Mountain Oysters. The others are the Boise Hawks and the Missoula Osprey (who offer a platter called "Bats and Balls").